How do we treat the different types of wrinkles? Injectable fillers, laser rejuvenation treatments, Pearl Fusion, PDT, Skin Needling, Mesotherapy and Carboxytherapy are mainly used for static wrinkling. Fillers soften lines and larger wrinkles by plumping them out so they look less evident at rest. In some cases, the combination of anti-wrinkle injections and fillers are used when the line or wrinkle is very deep and weakening the muscle action will help preserve the longevity of the filler. This is most common in the furrows between the eyebrows or bleed lines on the lip. Dynamic wrinkles are what separate anti-wrinkle injections and any of the injectable fillers. Anti-wrinkle injections are for dynamic wrinkling. It is a muscle relaxing agent so it will soften the wrinkles and lines that occur from a dynamic facial movement, such as between the brows with frowning, or the crow's feet from smiling. Wrinkle treatment should start as soon as one sees a wrinkle developing when the wrinkles are still "soft". If these wrinkles are neglected they become "ingrained" and "scar like" and they are then almost impossible to treat successfully. If we intervene early and fill in wrinkles with dermal fillers, then we can prevent these breaks in the skin. At Skin Renewal injectable wrinkle treatments and fillers are commonly performed at the same visit. Anti-wrinkle injections helps with the upper one-third of the face whereas injectable fillers generally help with the lower two-thirds. 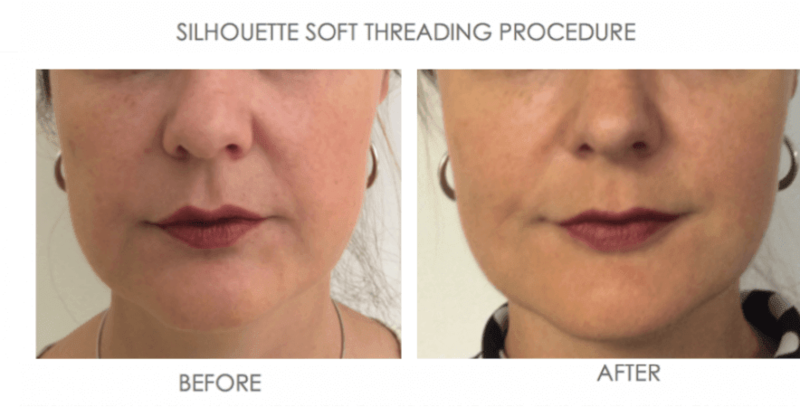 This combination is called a Liquid Facelift which is one of the most widely used and most effective methods of achieving a significant wrinkle improvement within 1-2 weeks’ time. 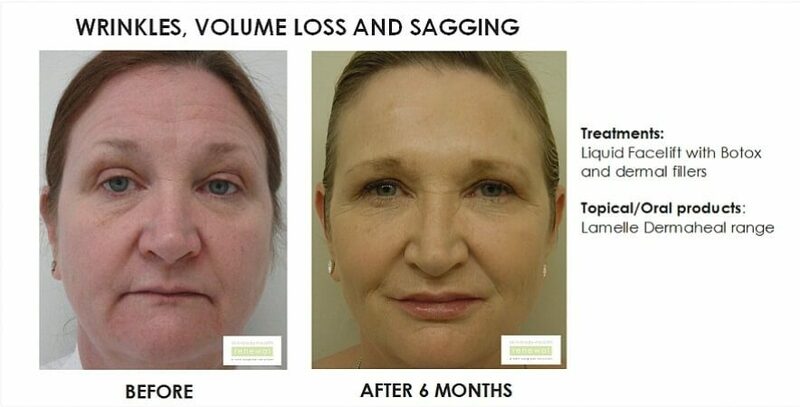 The Liquid Facelift can be combined with just about any other aesthetic treatment that exists and at Skin Renewal. We have safely combined these with our signature treatment 3-D Skin Rejuvenation™. Very happy, a pleased person always helpful. Sharon is doing my facials for a while. She is professional, treatments high standard and advice for treatments and products just as good. 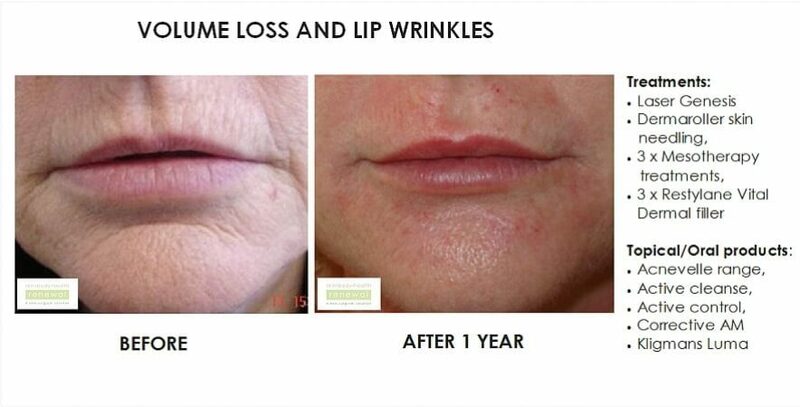 I had my first Dr PRP Facial at the Fourways branch last year October. Whenever the Skin Renewal training team and I decide to introduce any new treatments at Skin Renewal, I am always the first to try the new treatment out to ensure we can deliver results for our patients. I was interested to see if this Vampire Facial could make a difference to the overall texture of my skin. A few weeks after the initial treatment I started receiving numerous compliments about my skin and thus the decision to introduce the DrPRP treatment in the new year was a no brainer. I jumped at the chance to be the model for the doctor's training of PRP and thus was fortunate enough to receive a second treatment. Three weeks post my second treatment, our training team at Skin Renewal insisted that we take before and after photos to compare results of the 2 Vampire Facial treatments. We took follow up photos today and we were all amazed at the difference in the texture and clarity of my skin. 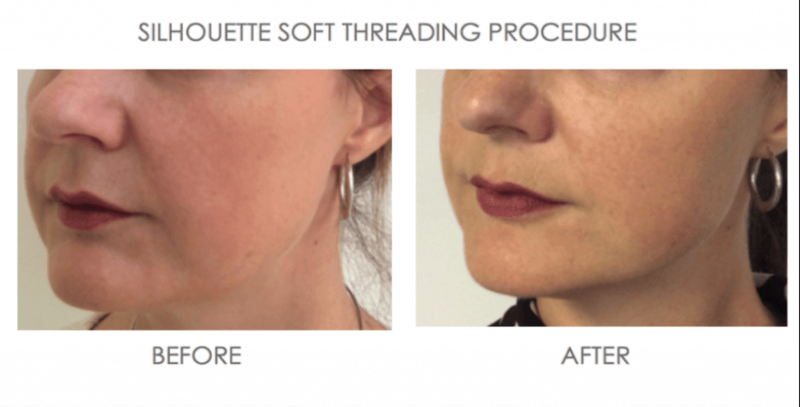 Here are the before and after photos on our Vampire Facial web page for all to see. What really impressed me was the improvement of my necklines and the texture of my chin...really thrilled with the results. What sets the Dr PRP system aside from the other PRP treatments out there is the double centrifuge process which delivers "liquid gold", a super concentrated PRP. At Skin Renewal the PRP treatment includes the face, neck, decollete and hands, so all neglected areas will be covered ... Can't wait to have my third treatment! Review -Not a line to be seen! After a few attempts by leading medical aesthetics doctors, including a plastic surgeon - they were unable to successfully remove the forehead lines with Botox. I was advised I need fillers there as my skin is too thin for effective Botox (I am over 60). Well, Dr. Maureen sorted it our in one 10minute session. Not a line to be seen!! Two months later it still looks amazing! Review -​Everything and More than I expected – I am a Fan for Life! 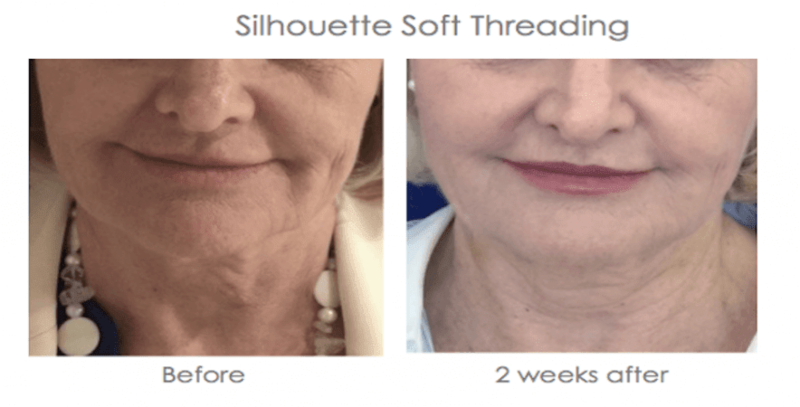 Thank you ladies, the results of my Silhouette Soft Threads procedure are everything and more than I expected! Sleeping is a tad uncomfortable for about 5 days after but the immediate effects are just so absolutely worth it! There was no down time. I am a Fan for Life thrilled with my face’s refreshed, lifted and fuller volume appearance. I was excited to get my "lifting threads" done at Parkhurst. I am on the wrong side of fifty and am against surgery. I was a bit nervous to start off with, but I can honestly say that the doctor was amazing. I had 6 threads inserted on each side of my face. The only slight pain I felt was where she injected me with a local anaesthetic before inserting the threads. I felt no pain during the procedure and no bruising at all! 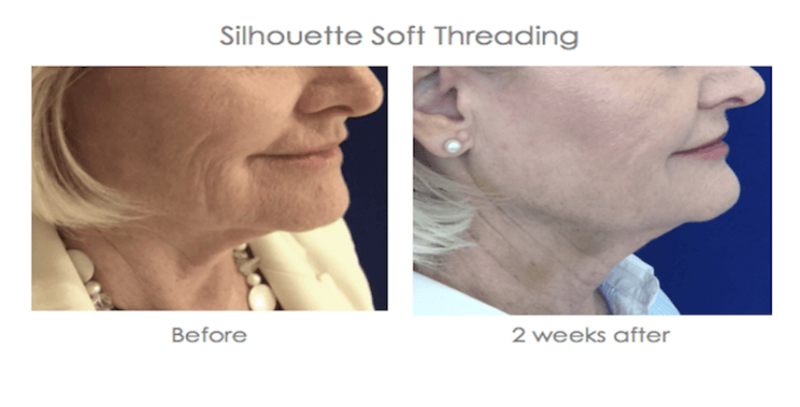 It has been 4 weeks since my threadlift and I am receiving numerous compliments each day. The staff at Parkhurst were so professional. Thank you. I would like to let you know how happy I am with your branch in Constantia. The team is amazing. Starting with the new receptionists: Stephanie is very professional, helpful and very welcoming, friendly every time someone enters or has a request. I always get an immediate answer to my emails and they try to help me out with my appointments (I had quite a few...) to the fullest. Dr. Fred is great doctor, very much aware of health and body problems and the way of treating them. I really enjoyed my IV treatments with him. I am the patient of Dr. Graham for a few years now and I do not want to go to any doctor anymore for my fillers, botox or threads. I visited before the best doctors in Milan and Zürich so have some experience. He is a fantastic person, outstanding doctor who listens to you and does according to your needs, preferences. Some of my international friends feel the same way about him. Last, but not least I have to mention my therapist. She is a lovely girl and an amazing therapist. She really loves her job and cares for her clients. She is very understanding and knows well how to treat different skin problems. She is not pushy and listens to the needs of her clients. A big thank you for all of you guys, you work really hard and do a great job. Review -Aiming for the best results! I have had Fillers before with excellent long lasting results. The treatment was at Skin Renewal. Overall pleasant. Strange, almost painful on removal of anaesthetic, skin looks plump - will see the effect later and comment again. Review -I am thrilled with my results! I was a little unsure a first having had bad experience with a well know wrinkle reduction Doctor and looked like an Alien! However, the team at Somerset West Skin Renewal is brilliant, Lizanne is very understanding, we discuss concerns together, she is very aware that I have a budget and does not push treatments I cannot afford. I have had the magic gas (Carboxytherapy) and E-Max Laser for fine lines. I am totally thrilled with the result and now have regular beauty treatments done by Lizanne too. She is Fabulous! Review -Lovely experience every time! The staff are very professional, Cheray is amazing! Lovely experience every time!